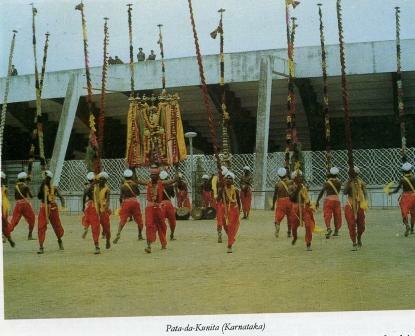 The Pata-da Kunita of Karnataka is traditionally performed at the time when a village deity is taken out on ceremonial occasions. The dance having deep religious association is believed to have originated from Vaishnavite rites. Pata-da Kunita literally means the dance of the Patas which are 10 to 15 feet long bamboo poles decorated with colorful silken ribbons and with a small umbrella made of either silver or brass fixed on top end of each pillar. The dancers wearing red dhotis, folded scarves slung crosswise from left shoulder to right side waist, and garlands, each holds a Pata, the lower end of which is put inside a bag of cotton fabric slung from the shoulder. While dancing, the dancers form various choreographic patterns. Some of the dance movements have elements of acrobatics. The percussion music is provided by two kinds of native drums, namely, Tamte and Nagarika.